Outlook is definitely my favorite email app. If properly configured, spear phishing attacks can be easily detected – and so is it here. 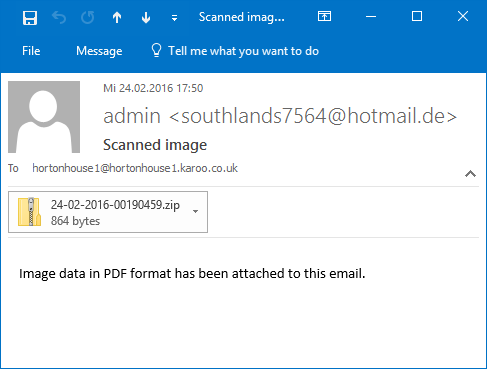 Email with Locky Attachment, click to enlarge. Since the size of the attachment was too small to contain an image, I opened the zip file and found a java script version of Locky.A inside. As always most of the popular anti-malware scanners identified the malicious code after one day. It’s important to note that even small changes to the code cut the detection rate dramatically. Cyber criminals can create new versions easily because java script can be simply modified with notepad. With this classic anti-malware system have limited effect only. How to deal with this challenge? First line of defense is as always user awareness training. In addition, in-depth scanning of all incoming and outgoing emails is required. To be honest, I would recommend to strip off suspicious attachments (whatever scripts, executables, compressed files, old style office documents, xlsm, docm, pdf with embedded files etc. ) and notify the users of the protection measures taken. Users will not be thrilled, but that’s much better than paying lots of money to cyber criminals or go out of business for a long time. Have a good weekend, and take care. This entry was posted in Opinion, Survival tips and tagged java Script, JS/Downldr.DJ.gen, JS/Locky.a, Locky, Ransomware, TrojanDownloader:JS/Locky.A on February 27, 2016 by Klaus Jochem. Hollywood Presbyterian Medical Center was hit by a ransomware attack around February 5th. At almost the same time some hospitals in Germany were hit by a similar attack. In both cases the attack was initiated by emails with malicious attachments. In both cases the impact was nearly the same: Hospital operations came almost to halt. And in both cases the IT groups were able to prevent the worst by rapid and effective intervention. IT operations, and thus medical operations, was massively hampered for some days because the malware rapidly changed its code. In such cases pattern based anti-malware systems have only a limited effect in recovery of IT operations. From my point of view, an effective ISMS is the best way to deal with ransomware. And the way the IT groups dealt with the attack shows, that they have an ISMS or something similar implemented and practiced. Hospitals are becoming increasingly dependent on a fully operational IT infrastructure. Even a shutdown of some days is hardly possible. Therefore, we need an entirely new approach for providing services to hospital staff. Spear phishing attacks, drive-by downloads, java script attacks, etc. are omnipresent today. Thus computers are potentially compromised because they are connected to the internet. This holds even if the computers are operated inside a company network only. The ‘trusted computer in a trusted company network’ paradigm is no longer relevant. A shift to the ‘zero trust’ paradigm is imperative to prevent unacceptable outtakes. The hospital IT systems are isolated in a Core Data Services Network (CDSN). Access to the CDSN is provided via virtual desktops. The Virtual Desktop Infrastructure (VDI) is hosted in the CDSN. Email- and internet access is blocked in the CDSN, as well as data exchange between the virtual desktops and the user workstations. Data exchange between the CDSN and the user workstations is controlled through secure gateways. Only the user workstations or smart devices have access to the internet and the company’s email system, which remains outside the CDSN. This is just a blue print. With Software Defined Networking it’s easier to implement today. The big advantage is that, even if a user’s workstation is compromised, the likelihood of an impact on the hospital’s IT systems and data in the CDSN is dramatically reduced. And recovery from an attack with ransomware is very easy: Run a fresh installation of Windows on the compromised computer. Sound’s easy, doesn’t it? This entry was posted in New Technology, Opinion, Survival tips and tagged anti-malware, CDSN, Ransomware, Recovery from Ransomware, VDI, Virtual desktop, Zero-trust paradigm on February 20, 2016 by Klaus Jochem. 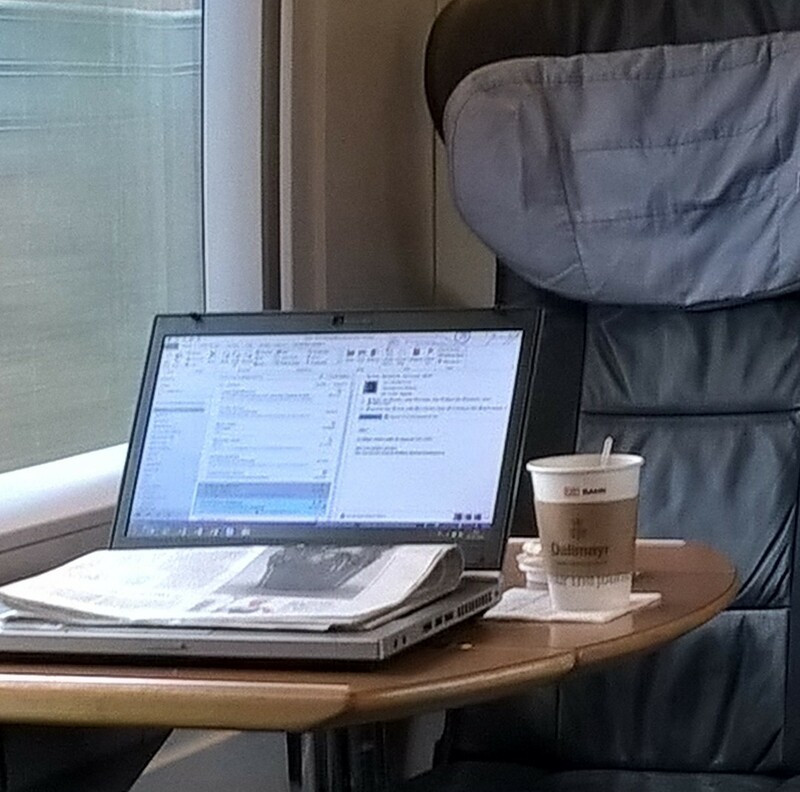 I saw this really strange version of a screen lock on a business trip to Frankfurt last Tuesday. Hopefully this is not an indicator for the general awareness of information security issues in Germany. This entry was posted in Fun, Survival tips and tagged Bizarre screen lock, Information security awareness on February 18, 2016 by Klaus Jochem. Password fields present on an insecure (http://) page. This is a security risk that allows user login credentials to be stolen. This is a clear sign that your service provider does not care of security. Since the continuous back and forth between browser application and the console is really annoying, this function was rarely used. With the latest Version 44 Firefox displays a notification in the URL bar if you open a URL with a password field across an unsecured HTTP connection. Approve the warning that you will be careful when changing settings. Take care, and enjoy the new security feature. This entry was posted in New Technology, Survival tips and tagged FireFox, Firefox Browser Console, Password field, security.insecure_password.ui.enabled on February 17, 2016 by Klaus Jochem. It’s definitely not enough to focus on the upgrade of the U.S. IT security infrastructure. Security protocols must be reviewed and adjusted where necessary. And employees must be trained in their correct application. Moreover, it is required to enable employees to say “No, I’m sorry, this is not allowed!” if an unambiguous identification of a caller is not possible. This entry was posted in Opinion, Survival tips and tagged CNAP, Cybersecurity National Action Plan, DHS on February 16, 2016 by Klaus Jochem. Electronic Grid Cards are often used for implementing strong or Two Factor Authentication. Although they offer lesser security than e.g. physical grid cards or authenticator apps, they are very popular because the rollout is easy: Just assign the grid card to the user in the authentication system, email the pdf document with the grid card, and off you go. Print the grid card and store the printout in a safe place. If required for convenient access, store the grid card on a secured mobile device. Delete the email after print and empty the mail programs waste bin. Delete the pdf document after print, make sure it is not cached or remains in the computers waste bin. Do not note down passwords on the back of the grid card. Please note that this list should not be considered as complete. In particular copies on whatever online storage may pose a risk to a company. A cyber attacker who hijacked a computer may find the online copy and use it when requested to do so, e.g., for safe logon to the company’s web access portal. This entry was posted in Survival tips and tagged Electronic Grid Card, Grid Card, Strong Authentication, Two factor Authentication on February 13, 2016 by Klaus Jochem. I was really shocked when I read the LIFARS post ‘Hacker Allegedly Dumps Data of 9,000 DHS Employees’ at 5:30 this morning. From this it’s apparent that the help desk hasn’t got enough training in the procedure for verification of a caller’s identity. In addition the passing-on of the token code is a massive violation of the security procedures. This entry was posted in Puzzling discussions, Survival tips and tagged DHS, LIFARS, U.S. Department of Homeland Security on February 9, 2016 by Klaus Jochem.